“I am enormously pleased and extremely honoured to become an honorary doctor at Uppsala University,” says Lena Fries-Gedin, newly appointed honorary doctor at the Faculty of Languages. On 25 January this year’s winter conferment ceremony took place. Eighty-nine new doctor degrees and 19 honorary doctor degrees were conferred during formal ceremonies in the Grand Auditorium. The week before the conferment ceremony, the new honorary doctors presented lectures that were open to the public. 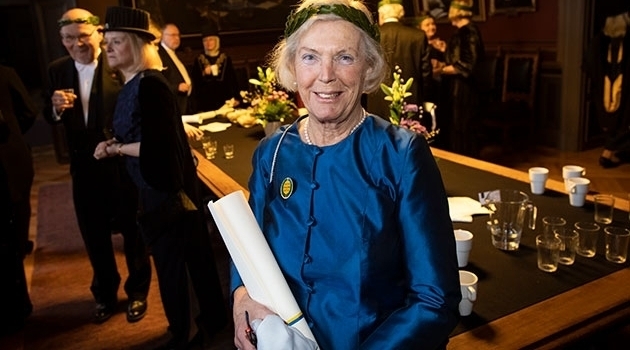 One of them was Lena Fries-Gedin, who was appointed an honorary doctor at the Faculty of Languages. Lena Fries-Gedin was awarded this honour “for her unwavering fidelity to the word in all its variable essence and forms.” She translates to Swedish from English and French and is best known for her translations of J.K. Rowling’s Harry Potter books. “I am enormously pleased and extremely honoured to become an honorary doctor at Uppsala University. Being appointed an honorary doctor at the Faculty of Languages also adds to my delight in this honorary title,” she said in connection with her lecture in the Humanities Theatre, where she talked about her work as a translator under the title “On a journey of discovery in the world of language”. Lena Fries-Gedin studied Slavic languages, including Russian, Serbo-Croatian and Polish, at the University from 1953 to 1965, and she has worked as a language teacher in Härnösand for 30 years. She had already begun translating books for children and young adults during her time as a student, and in addition to the Harry Potter books, she has translated more than 80 books in various genres for both children and adults. The series became a total of seven books that had a huge impact and attracted greater attention to the role of the translator than ever before. During the lecture Fries-Gedin also talked about the translator’s craft.